Dragon Boat NSW in partnership with Bidgee Dragons will be hosting its third dragon boat challenge in Wagga Wagga in 2015. 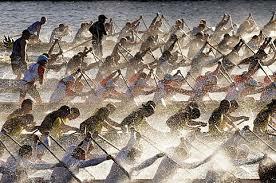 The Challenge is open to anyone in the community who would like to try dragon boating. Boats, equipment and training are all provided, you simply need to recruit 20 people (work colleagues, sporting colleagues or a group friends) and be prepared to have some fun! The distance raced will be 200 metres. Spectators are welcome and catering will be available. Bring your own blanket, chair and sun shade to ensure your comfort.